“Welcome to Good Burger, home of the Good Burger, can I take your order?” these words chime with nostalgia, bringing a smile to the faces of practically any kid that grew up in the ‘90s. 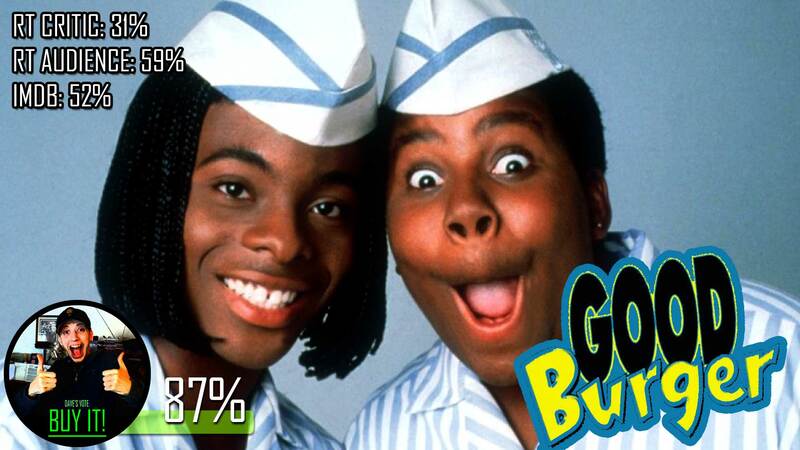 Good Burger began its popularity run on the hit Nickelodeon sketch show, All That. If you don’t know what All That is, it’s been defined as the SNL for kids. It started the career for many actors and actresses, such as Amanda Bynes, Nick Cannon, Drake Bell, Kenan Thompson and Kel Mitchell. Kenan and Kel of course went on to film Kenan & Kel, and Kenan can now be seen on SNL, seemingly come full circle. Good Burger was a skit on All That, which became so popular that it got its own movie back in 1997. This was back in the day that Nickelodeon was obsessed with the color orange, and even their VHS tapes were orange. Why do I like it so much though? Dexter Reed (Thompson) is just a kid that wants to have a good time. Lucky for him, summer break has just begun, so he speeds off in his parents’ car, and immediately hits the car belonging to Mr. Wheat (Sinbad), his teacher from school. In order to pay of his debts, he has to get a summer job at Good Burger. Only, the guy who caused his accident works at the counter, by the name of Ed (Mitchell). Ed is really a stupid but hilarious character that lets people walk all over him because he trusts in people. So when their competition burger joint opens up across the street, Good Burger must find a way to prove that the little guy has what it takes. They may be in luck when Ed shows up with his secret sauce, which of course, just looks like orange Nickelodeon slime. Why do I like this film? Partly because I am in the group of kids that grew up in the ‘90s, but also…because the movie is hilarious, they still got it. You love these characters to death, and I am not sure if anyone has ever really matched the chemistry of friendship that these two had in years. Any kid would watch anything that these boys did together. That of course, was almost handed down to Drake & Josh, but nothing could match the friendship they had. Next, adding to the hilarity is the one-liners. There are so many great lines in this film, it’s ridiculous. You can post the beginning of practically anything ever said in the movie, and you can get someone to either finish the line, or say “lol, I gotta watch that movie again”. People love this movie. Other than old Disney films, classic children movies are really hard to come by. Stuff that will be around forever. I don’t know if this will be around forever, because a lot of the energy comes from the actors that people know of or remember. For me, however, it will remain an instant classic set apart from the rest. Critics have it rated low with no general consensus (RottenTomatoes). I can honestly say that I just…don’t understand where they are coming from. I know it’s a kid’s movie, so the writing isn’t going to be amazing, but this is stupid comedy, people. I also don’t know many kids movies that are based on dumb humor. They did a great job at making Ed a really dumb character, but one you can care about, giving him heart and soul. Who should watch this? It’s safe to assume anyone who grew up in the ‘90s would love this film to death, and I would suggest not only for them to watch this, but to buy it. The rest of you? Rent it to at least understand and respect what the ‘90s kids grew up with.